As smartphones become the norm in some parts of the world, the biggest problem many mobile users have to deal with is running out of battery life when you're far from home. In response, charging stations are popping up all over the place, and Thai soy milk company Vitamilk recently unveiled a pretty cool project of their own to help smartphone owners on the go. "Dead Batteries for Dead Batteries" finds the power to charge smartphones from an unexpected source: used-up disposable batteries. A typical discarded battery still holds about 400 mAh of power on average, so if you put enough together they should be able to recharge your smartphone. That's the idea behind Vitamilk's new charging kiosk. 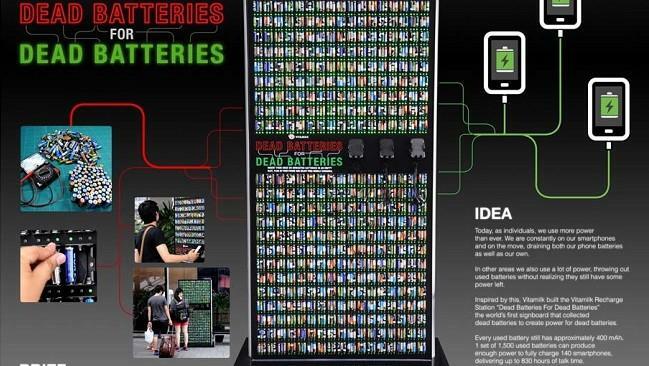 There's only one charging station for now, which holds 1,500 dead batteries at once and uses them to charge about 140 smartphones. It seems like "Dead Batteries for Dead Batteries" is more publicity stunt for Vitamilk than serious endeavor, but hopefully the company will expand on the idea and even set up more kiosks in the future—or at least inspire more companies to follow suit.